It’s always a surprise to find out someone is not who you think he is. Sometimes, the deception seems almost heroic – remember Frank Abagnale in his memoir of Catch Me If You Can, made into a movie, and now a Broadway show? For Clark Rockefeller, however, the story is criminal and almost unbelievable. 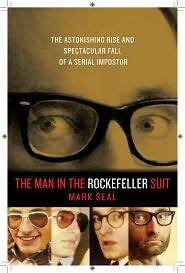 Mark Seal’s The Man in the Rockefeller Suit tells how German born Christian Gerhartsreiter conned everyone into believing that he knew more than he did, that he had a storied and wealthy family background, and that he actually cared about relationships he curried. Through interviews and letters, and by tracking the elusive Christian aka Chris aka Clark into his past, Seal reveals a man who would use anyone to better his own life. Unlike Frank Abagnale, Chris/Clark is not a character you will like; you might even wonder how he was able to convince so many to support him. When he offers to move the medieval Chichester Abbey, which he claims to own, from England to the United States, you may be rolling your eyes at the naiveté of his targeted marks. Seal goes back to Germany to find the origins, which turn out to be relatively normal, except for a young opportunist’s motivation to better himself – without working for it. Gerhartsreiter learned early to use everyone; eventually, he made it to America, married for a green card, and established himself in a small elite California town to begin to create the life he wanted for himself. He managed very well, cleverly using acquaintances for introductions or as references; he often joined church groups and ingratiated himself with wealthy members – becoming a willing guest in their homes. When someone suspected, or his bills caught up with him, he merely left and started another life, carefully erasing any traces – using false social security numbers along the way. Seal includes 16 pages of photographs of Gerhartsreiter at different stages of his faked life journey; the man seems to morph into many different faces to match the new persona he adopts. Eventually, he made it to New York City’s wealthy East Side, married Sandra Boss and divorced. This part of his story was made into a made-for-TV movie. He finally blows his cover when he kidnaps their seven year-old daughter, and leads authorities on a mad chase that eventually reveals who he really is. I missed all the details of this story when it was current, not too long ago, but Seal’s accounting probably gave me more than I wanted to know. His staccato reporting style added details that clogged the narrative, with Seal playing detective to track down and interview anyone who could document the unbelievable arrogance of a man who convincingly lived a lie. The story attracted me with its premise, but Seal takes too long to tell it. Seal ends with the breaking news that Clark Rockefeller has been indicted for murder – one of the do-gooders along the way that he conned. And so, this real story that seems like fiction – continues.